I've told you, haven't I, how crazy the weather is in Boulder? In the morning you can be wrapped up against the snow and biting cold, and in the afternoon you're wearing a T shirt. They get a lot of snow, but it's not the right kind of snow for making snowmen, or even proper snowballs come to that. Except when it's melting. 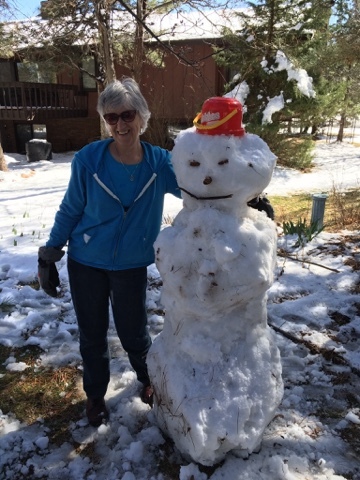 So on Sunday afternoon when it was warm and bright, Isaac and I made a snowman. The girls only became interested when it got to the pine cone feature stage: I think it was their first snowman. And here is my last picture from Colorado: Lux and me on the Carousel of Happiness. 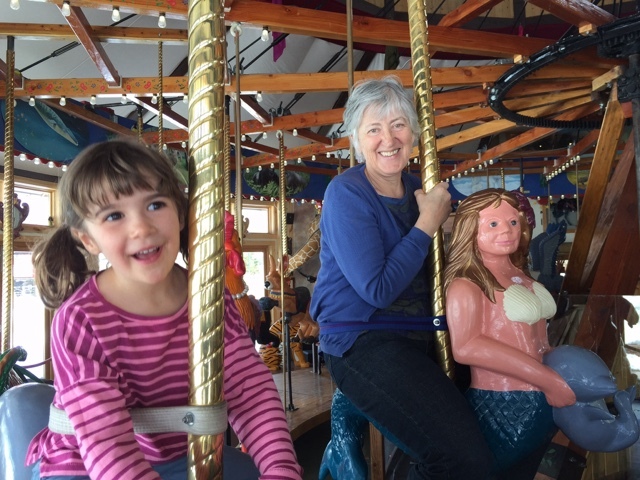 It will be a sad day for the adults when the girls grow out of the trip up to the small town of Nederland in the foothills (8,000 feet up) where a tiny building houses this fabulous carousel with hand carved wooden animals ( and mermaids!) and with a Wurlitzer organ in the centre.